It is no secret that I absolutely adore everything about Krishna, the blue God. I find his persona to be extremely intriguing, and equally endearing. So I am always curious to read more about him – in any way that I can. Mostly, this just translates to reading Mahabharata from several different POVs. Which is why, when I first got to know of this book, based on Pradyumna – the son of Krishna, it felt like a refreshing change. While I have heard of Pradyumna in passing, I have never read much about the son, whose life must have been heavily influenced by his father. This was a new lens to view Krishna from, so I was pretty excited to read this book. 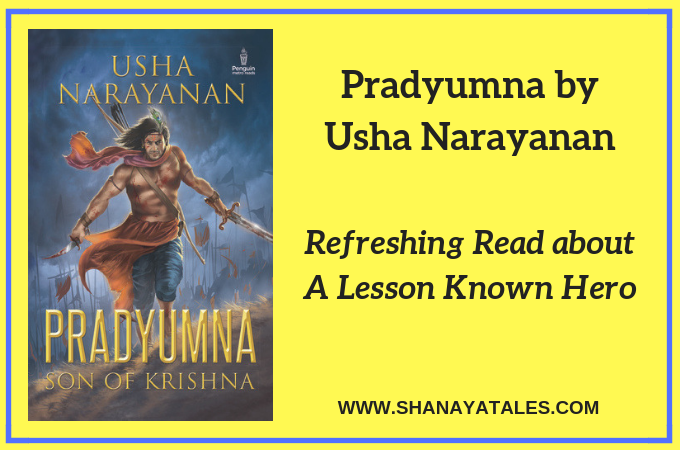 The plot mostly revolves around the life of Pradyumna, but the author has also weaved several other small tales around the main story line. Impeccable Language – I have seen a lot of good stories getting buried under the weight of bad grammar and language, and it is such a shame. In this book, the author’s command over the language is visible, and it makes it a joy to read. Maintaining Period Authenticity – In the genre of historical fiction, only good English doesn’t suffice. The language used must be reflective of the time and age the story is set in, and the author has done complete justice to this. In addition to the language, the characters, their motivations, the conflicts in their world, and even their attire -everything is kept true to the period the story is set in. Beautiful Descriptions – I must mention here that I am not overly fond of lengthy descriptions, irrespective of how good they are, but even I can appreciate the beautifully poetic ones which are present in this book. On the other hand, if you are someone who normally enjoys vivid descriptions, then this book will be a visual treat for you. Sequence of Events – There is one thing that I feel could have been different -the timeline. I would have loved to follow Pradyumna’s life across a linear time-frame, as that would have avoided confusion in some areas. For instance – Abhimanyu is shown to have married Vatsala right around the time Pradyumna married Rukmavati. At this point, the Pandavas had not gone for their exile. Then there was the 14 year exile, followed by the great war of Kurukshetra, where Abhimanyu met with his death. Now, Abhimanyu had died at the age of 16; so calculating backwards, that makes him around 2 years old when he got married to Vatsala, which clearly was not the case. I have considered the possibility that I might have got this wrong, and I have re-read the text a couple of times to cross-check, but this is how I understand the sequence of events. Even in the situation that I HAVE got this wrong, I am probably not going to be the only one. This could have been avoided with a more linear timeline. It was refreshing to read about a new/lesser known hero, in the genre. I would certainly recommend this book to people who read Indian Historical Fiction, and who would enjoy a visual tour of that era. Will I read the Sequel? 1. An insider’s view of life in Dwarka. 2. The Yadav perspective on the events unfolding in ‘The Mahabharata’. 3. But above all – The events that led to the decimation of the Yadu clan. The author has handled point #1 and #2 to some extent in this book. I am assuming the sequel is going to deal with point # 3, which is what I am most excited to read about. So I will certainly keep an eye out for the next book in the series. Important Update: After I posted my review, the author has informed me that the book has gone through another round of edit, and that the timeline issue has been rectified. In this book, the author has attempted to write from a relatively unexplored POV, which is always interesting to read. My favorite POV in this genre so far has been of Draupadi’s in The Palace of Illusions. But I would love to hear from you guys. Do you read this genre? Do you think there is a hero/heroine whose POV needs to be explored more? Which has been your favorite POV so far? Superb review!!! I do have a question though. Do u only do reviews of books that are by Indian authors? And where can one get their hands on these books easily? About reviewing books by Indian authors – Nope, I mostly read American authors; I just happened to have a long Indian streak. Incidentally, the next 7 odd reviews are all books by American authors. 1. Amazon.com – Buy Kindle Book (as Paperback can be very expensive in this case). 3. Books like The Palace of Illusions – by Indian Authors living in US – you can find them in public libraries in US too. Yes, Indian historical fiction has picked up in the last decade. Do check this one out when you get a chance. Thanks for this review of what sounds like an interesting book – and a topic/genre with which I am totally unfamiliar! And yes, I agree. We need fresh POVs in the genre. I’m rather ignorant of the mythology this book is based on but what I really liked about your comments was about keeping character’s goals and motivations true to the setting and time period. It takes a lot of research to get in the head of historical characters. Hey babe. Great reviewing. Like you say the character is an intriguing, lesser known character from the Mahabharata. Honest and crisp review! I thought there was something wrong with Abhimanyu’s marriage and Kurukshetra war. I couldn’t quite put my finger to it. I was breaking my head for a brief time and then forgot all about it. Just ordered this one. I love mythology too. Different perspectives make it very very interesting. Looking forward to this one. Let me try to figure out the timeline. By the way do you read books in Hindi? Just wondered. Yet to read this one. Off late, am seeing so many book on Hindu myth and skeptical about the authenticity of the events. Well, this one has fiction mixed along with fact. However, with mythology, no one knows for sure what the ‘fact’ is. What do you think? This is WAY outside my usually reading zone, but it sounds wonderful. Any time the historical aspect is done really well, I’m in love. Lovely review Shantala. 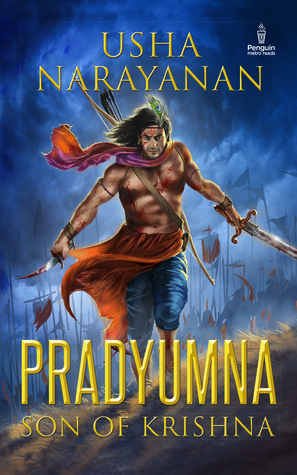 Pradyumna is a character I didn’t read about till I began reading this book. I am fascinated by the different layers and sub-plots to this story – wondering why it hasn’t been getting more book reviews too. I agree with you about the sequence of events – at some places, it begins to feel confusing. Overall, it’s a book I enjoyed reading and I have to admit that I am also re-reading sequences that I enjoyed. The battle scenes are really imaginative and capture your interest, as a reader. True, the battle scenes are done very well, and this book gave the genre a refreshing new POV. Nice review. Historical fiction interests me and the the plus points are strong. Probably this is one book I would like to read. I agree, it is kinda confusing even in the original, but here it’s obviously conflicting with the timeline and facts within the book.